The Palm interface cable allows you to connect the Camera Controller to a Palm cradle or hotsync cable for programming the controller. It is very easy to build. You will need a soldering iron, solder, wire strippers and a small screwdriver. Step 1: Cut off about 1" of the outer jacket at each end of the length of cable. The cable requires three conductors. You may use any three but the convention is to use the black, green and yellow wires. Cut off the exposed piece of red wire from each end. Strip about 3/16" of insulation from the end of each remaining wire. Step 2: Using needle nose pliers secure the a crimp pin to each wire at one end of the cable. The tabs on the crimp pins are designed with a split in them. One part of each tab secures the insulation and the other part makes contact with the exposed wire. Do not over crimp or you may deform the wire and weaken the connection. If you purchased a cable with precrimped connections then you can skip this step. 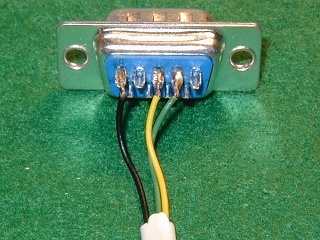 Step 3: Slide the crimp pins into the three pin connector in the order shown in the picture below. Each crimp pin has a little, raised catch that locks into the slots on the bottom of the connector. 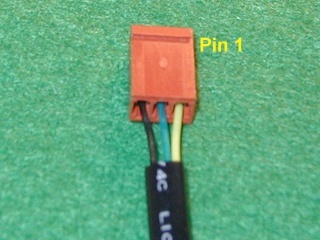 Pin 1 is on the right in the photo. 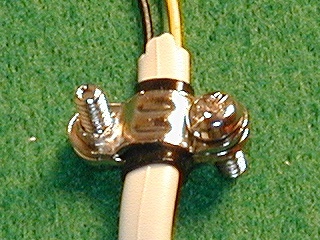 Note that your connector may have two alignment tabs not shown in the photo. They should face up in this picture. 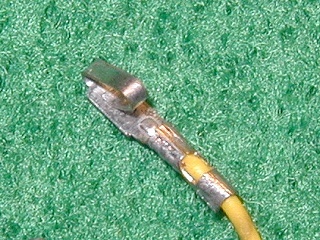 Step 4: Add the strain relief clamp to the cable about 1" from the connector using the two short screws provided as shown. You may need to wrap a layer or two of tape around the cable to make it snug. You can also simply tie a knot in the cable near the connector and forget the clamps all thogether. Step 5: Snap the hood over the connector and secure it with the screws and nuts provided. That's it. If you were careful with the wiring the cable should work fine. Problems are almost always due to a miswired cable. Check your connections carefully.